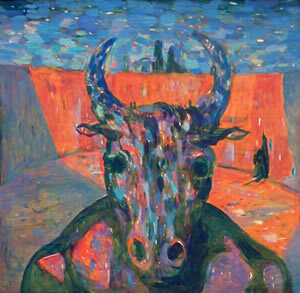 Above: "Minotaur" 2006, acrylic on masonite, 24" x 24" approx. From a new mythological series of paintings. 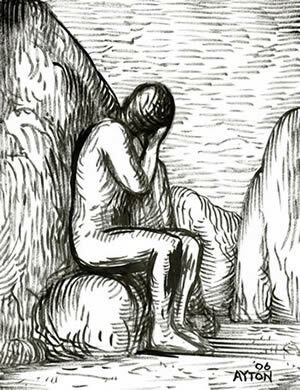 Below: "Melancholy Colossus" 2006, brush & ink on paper, 11" x 8.5". This page contains works done by William T. Ayton in 2006. Many of these pieces were shown in the solo exhibit, "Myths & Monsters" at the Barrett Art Center, Poughkeepsie NY, from Oct 21 - November 18, 2006. Click on the thumbnails below to see larger reproductions.